Sensations of plants! Oryxes going home! Unique human-animal bonds! The exquisite development of the newt! This is our nature program and it’s full of astonishing images and surprising viewpoints. Because, after all, human survival is bound to that of our natural environment, and the better we can understand and defend that environment the better off we will be. Urges in the undergrowth, erupting fungal fantasies, bursting botanicals; the dust and desires of a tiny alternative universe. A mixed media, experimental animation imagining attraction and pleasure in insects, and the seduction methods of the plants and fungi that beckon. We share our planet with over 2 million species, but upto two thousand become extinct every year. What if we could turn back the clock for one of them? Back to the Wild explores this question, tracing the journey of Nya and her fellow Scimitar-horned Oryx as they travel from Abu Dhabi and return home to Chad after being extinct in the wild for over 25 years. The film follows the Scimitar-horned Oryx Reintroduction Project — the largest mammalian re-introduction effort in history. It aims to serve as a blueprint for the re-introduction of species all over the world, and is a testament to the need to nurture and protect our natural environment for generations to come. Yussuf Mume Saleh journeys nightly into the outskirts of the walled city of Harar to bond with his beloved hyenas, a ritual he has practiced for over thirty-five years. Shot in Black & White, Hairat is a meditation on this uniquely symbiotic relationship between man and wild beast. Follow the journey of one honey company in the UAE, as they struggle to keep their bees alive. A series of 6 chapters that explores the future of humanity through the embodiment of the future in evolving creatures. The film explores human / animal antagonism through buffalo and other animals living in the Red River Delta. The freedoms of the mandalas, which spend a long period of the year in the delta, end with their owners taking them to the stables, a cultural product. Becoming is a short film about the miraculous genesis of animal life. In great microscopic detail, we see the ‘making of’ an Alpine Newt in its transparent egg from the first cell division to hatching. A single cell is transformed into a complete, complex living organism with a beating heart and running bloodstream. 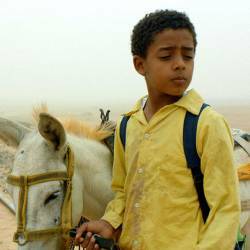 A Coptic Christian leper, his 10-year-old Nubian Muslim sidekick, and their loyal donkey, leave the confines of their leper colony for the first time.